Shane Shirley : Want Green and Healthy Recipes? Check this Eco Recipe Site that Kicks Booty! Want Green and Healthy Recipes? Check this Eco Recipe Site that Kicks Booty! Hi there peeps! I am in full swing getting ready for the Holiday...if full swing means I still have to buy and wrap presents and prepare a Green Christmas for 30 people. It seems like there is never enough time in the day for kids, volunteering, husband, work, bills, shopping blah blah blah. Anything I can find to green my family and make my life easier is mega valuable to me and I have a great find to share today. There are certainly a ton of recipe blogs and sites out there but I have never really found one that flipped my lid until today. You must check out the Eco Recipes blog. 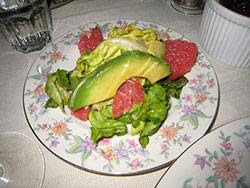 The first dish that grabbed my attention was the Avocado Citrus Salad recipe as I am an avocado freak. The recipes take the angle of no GMO's, refined sugars or unhealthy fats and there are some really delicious sounding dishes to prepare. Check it out and enjoy some delicious healthy eats! I used to stay away from avocados as I thought they were so fattening, but now I know that they are full of the good fats. Glad to see you here! Check back in. Like you, I'm also an avocado freak, I just so love to eat that fruit and it is good for the skin too! I love them too! Thanks for stopping by and be sure to try the recipe!